This view looks along one of the colonnades in Auckland's Supreme (now High) Court building, which was designed by Edward Rumsey and opened in 1868. 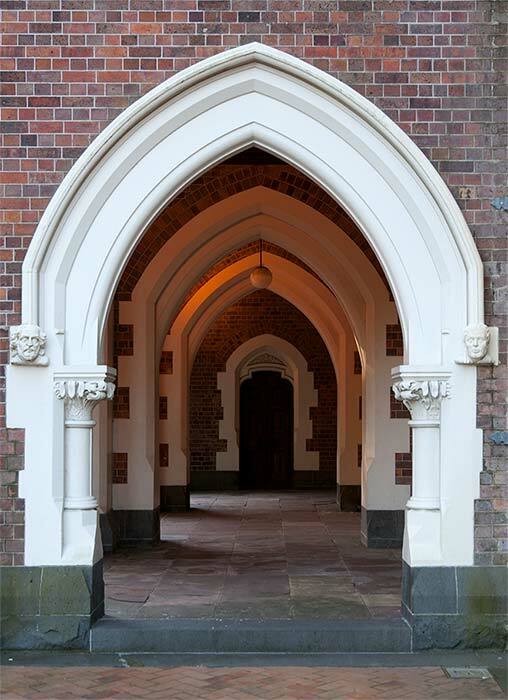 The pointed arches were characteristic of the Gothic revival style. A novel feature of the building's facade was a series of gargoyles (an attribute of medieval Gothic architecture) and carvings of prominent public figures made by Anton Teutenberg. The carving on the right is a representation of the Ngāpuhi chief Hōne Heke.